U.S. Rep. Cathy McMorris Rodgers, a Spokane-based Republican, has signed an initiative petition aimed at undoing a city ordinance that prevents municipal workers from questioning people’s immigration status. 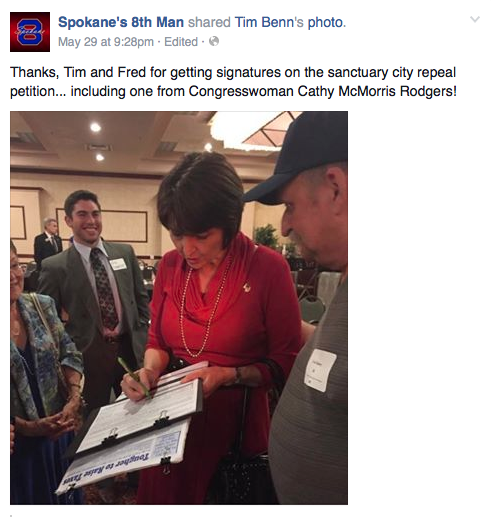 A photo of McMorris Rodgers, the fourth highest ranking Republican in the U.S. House, signing the petition was posted to the Facebook page of Spokane’s 8th Man, an informal civic group critical of the liberal orientation of the current city council. "Citizen involvement is the cornerstone of our government, and I applaud the work of local activists who devote their time and energy to issues important to them. If this petition is successful, the decision will go to the voters this fall." The ordinance was passed in October to codify an existing city policy. Supporters say it makes immigrants more likely to cooperate with law enforcement. Opponents say it rewards law-breaking and could allow foreign criminal elements to go unscrutinized by police. Last year, McMorris Rodgers expressed support for comprehensive immigration reform in Congress.